My Friends Have Changed !!!!! Life is amazing. Sometimes it makes us feel like friends are everything and on the other hand sometimes it makes us feel like they are no longer my friends. They become professionals. If it is the case with you then this post is for you. However always remember Life is beautiful: Live it , Learn it , Love it. Earlier I wrote about friendship but is specific to friendship day. If you are in university pursuing your education , you may miss your old friends from previous universities/ schools OR you are professional and you miss your friends. Some day you tried calling your friend , but before call gets connected you hung phone thinking “Why should I call him/her? He/She should call me. I was his/her close friend.” Or “He/She might be busy. He/She will call me when he/she gets time.” At initial stages it is more like I should not disturb him/her but as time passes it becomes “why should I contact first?” . But my dear friend have you ever thought what your friend is thinking ? What if he/she is thinking the same way and you both were waiting for other person to contact you first. So dear reader “Nothing has changed. You are still friends. Life is still beautiful”. Don’t wait for other to contact you first. Posted in Food For Life and tagged beautiful, call, college, contact, first, Friends, friendship, graduate, learn it, Life, live, love it, professional, school, still, university. Bookmark the permalink. Every year friendship day is celebrated on first Sunday of August. We celebrate it every year ,but as we grow older ,the form of celebration changes. School student , college student and professionals celebrate it in a different way. In this post I am just writing how the way of celebration changes as we grow older. First as a school child we tie “Friendship belt” at every friends hand. Even we tie “Friendship belt(band)” to aunt/neighbour if we have extra “Friendship belt”. And next day at the school we show one another our friendship belt and boast if you have the highest number of “Friendship belt”. As we finish our school and most importantly HSC we enter into “golden” college life. College student are whose enjoy it fully. We have our group/class . We spend almost whole day together. The way college student enjoy this day is best described in below video. As we start working at somewhere, we are no more with our group and class. We meet new people who behave more professionally. But on this day we remember our friend and plan to meet somewhere at least for a day. (As it is on Sunday). And we have a great smile on our face. As we gain more experience as well as we grow older we have responsibility and we turn ourselves busy into these activities. 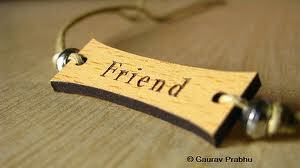 But even on friendship day we remember our school/college friends and call some of them. Now we see our children enjoying their days and we are more concerned about their future. And finally comes the old age. Now we have our grand children and our children are living professional life. Now we become alone and some of our friends are no more on the earth. We are left with only sweet memories. We share our memories with our grandchildren and try to see ourselves in them. Posted in Food For Life and tagged age, celebration, college, day, Five ways, Friends, Frienship day, grow, Life, Love, memories, old, professional, school, why friend?. Bookmark the permalink.